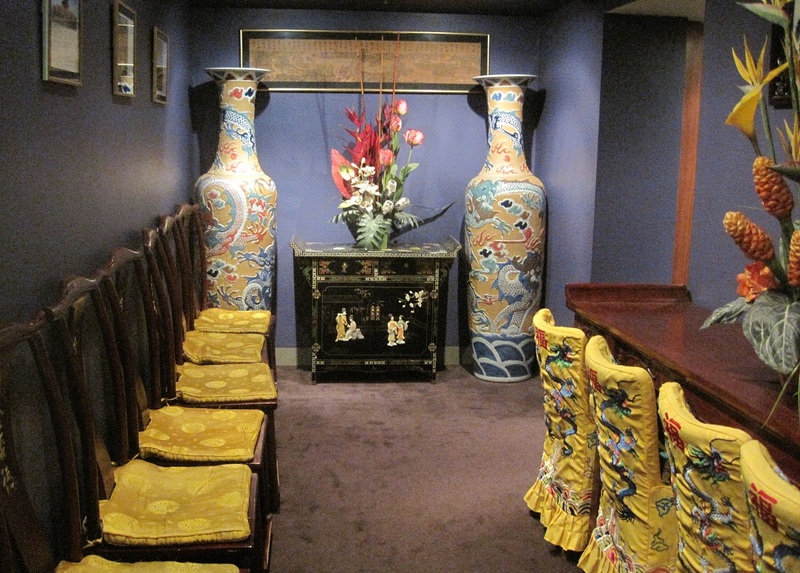 This is a very flashy looking place, it looks like the interior designer has gone 100% Beijing style. 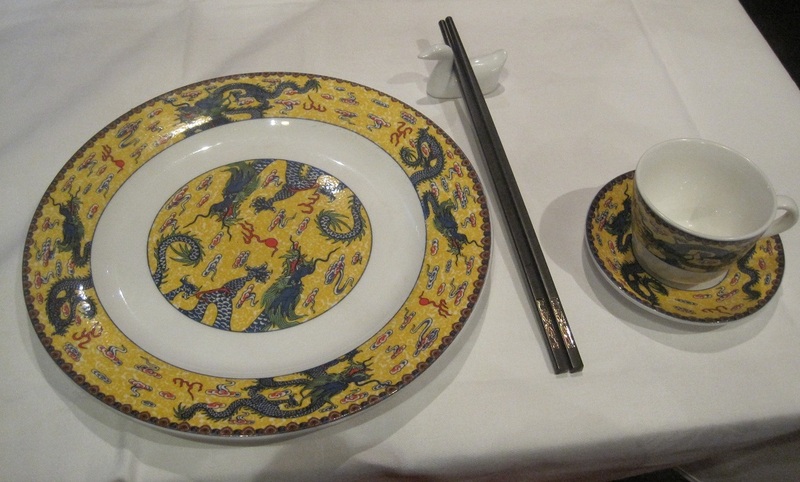 If you had guests from China, this would look like the kind of place you’d want to wine & dine them. 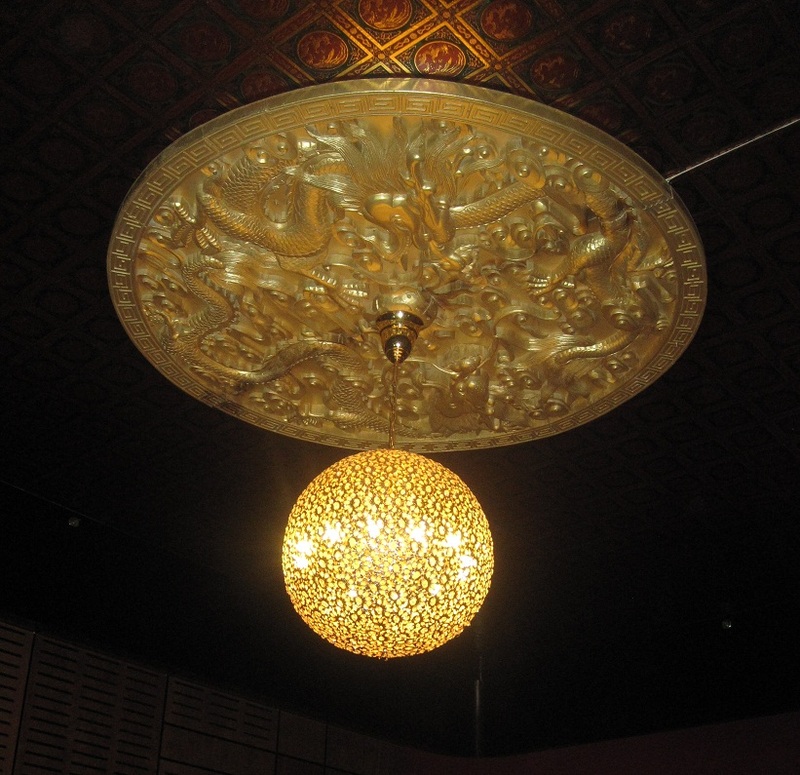 A lot of money has gone into making this place feel like you’ve stepped into a Hollywood movie about a Chinese restaurant. If you’re impressed with style over substance, this would be the place to go. This is the waiting room adjoining the toilets and even this is a bit fancy. It’s a bit OTT for my tastes but I’m not about the decor, I am all about the food. I’m not too hungry, but all I want is that duck. Before we’ve had a chance to peruse the menu, the manager asks us if we’re intending to have duck for dinner. As it’s a banquet, he’d need to know now so it can be prepped. We go for the half banquet & he toddles off while we check out some appetisers. 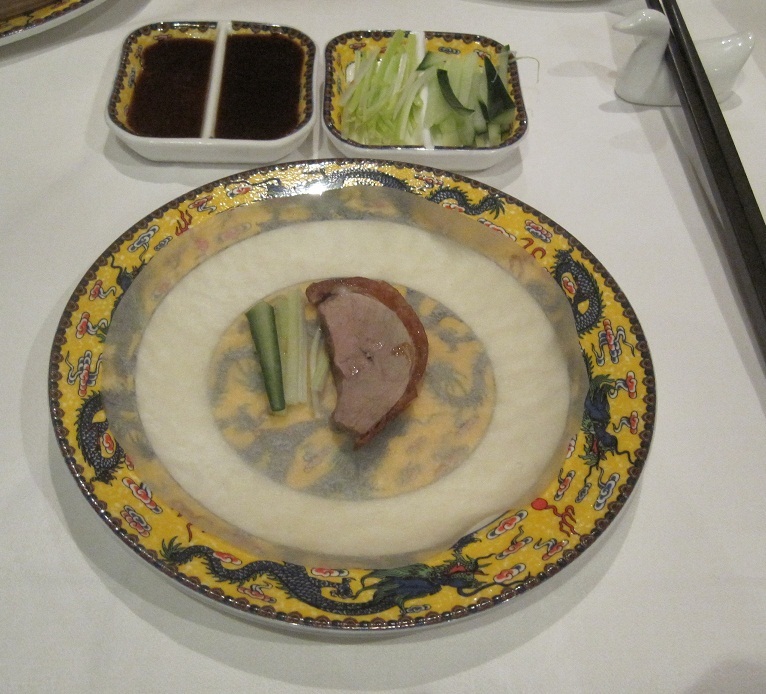 The half banquet includes duck (obviously), pancakes, spring onions, cucumber & duck soup – $40. We ask for water & my friend asks what teas they have on offer. The waitress gives us chinese names for the tea, struggles with interpreting to english & calls another waitress. The 2nd waitress seems unbothered by our enquiry and just says they have lots of tea without elaborating. Eventually, we go for a pot of jasmine as this is getting a bit too hard for a bit of tea. Oh wow! 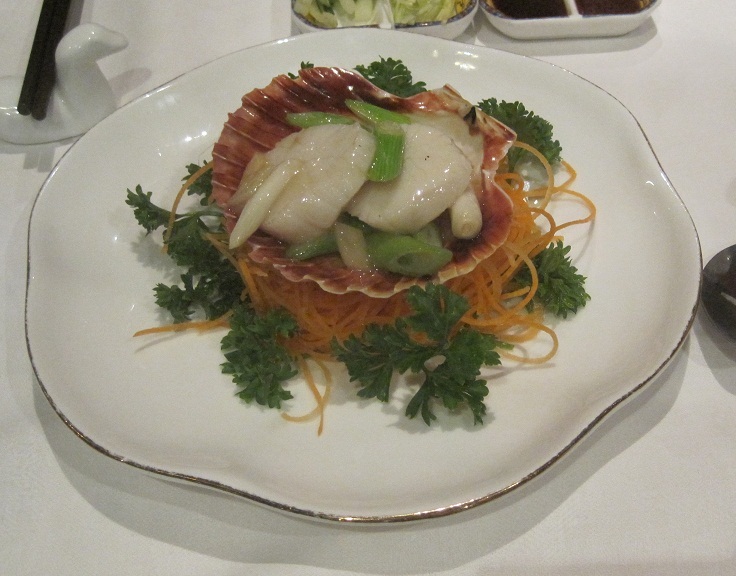 Awesome start to the night, perfectly cooked scallops in a tasty ginger sauce. Creamy, succulent, just all round delicious. Sorry, can’t remember the price of this dish, but it was worth it. Only con would be the massive chunks of ginger in the dish which overpowered everything if you bit into one, best to leave that chunk on the plate & enjoy the scallops & shallots. It’s now time for the duck banquet and I gotta say, after the amazing entrée, I’m expecting the duck to be even better. These pancakes are different to others I’ve had, these are super thin, translucent sheets so the flavour of the duck won’t be diluted/floury. The Peking duck is placed on our table without any fanfare, we also don’t get to see the carving in action – perhaps that’s reserved for people who order the whole duck. I’m a bit unimpressed with the size, when you think $40 banquet (even if it is a half banquet), you don’t think of a small plate with a bit of meat. I think banquet is not the right word to describe this as it consists of only 2 courses and a small amount of food. Banquet brings to mind volumes and excess – this does not look like a banquet to me. Enough of my whining, time for a taste. I like the sauces, they’re on the sweet side and the peanut one tickles my fancy. Unfortunately, the duck itself is not a standout. It’s good, but I’m not here for good duck, I’m here for stupendous duck so I’m not satisfied. It leaves me depressed and my taste buds feel that I’ve liked to them about the experience they would be having this night. The scallops were so good and yet the duck is ok – but this is supposed to be a duck specialist restaurant! I’m glum, all the hype, the Heston endorsement, the history in China has amounted to an ok meal in Melbourne. We still polish off the duck, but it’s lost its sparkle to me. The flesh feels a bit overcooked and the crackling is quite fatty and without enough crackle. 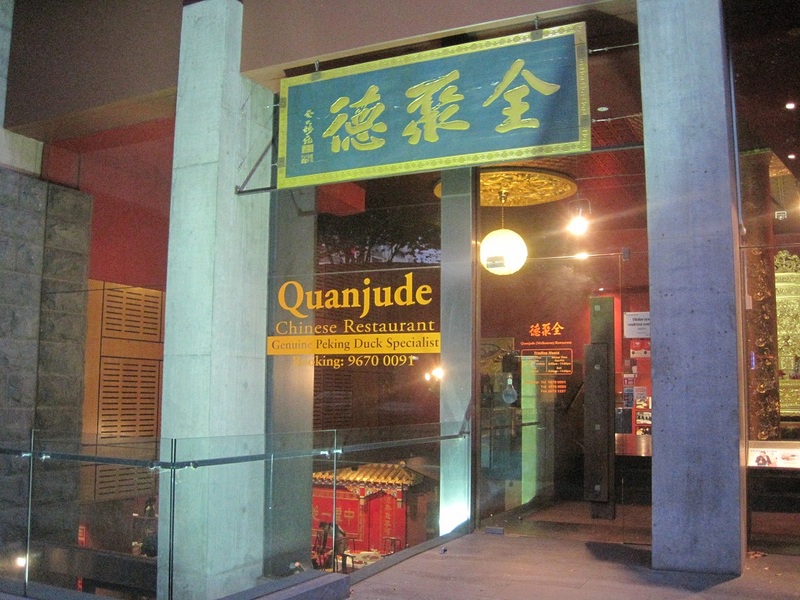 And Quanjude’s Peking duck is stated to have ~7.5% fat – maybe the entire 7.5% was in the crackling we ate? All I can say is, I’ve had better Peking duck elsewhere. 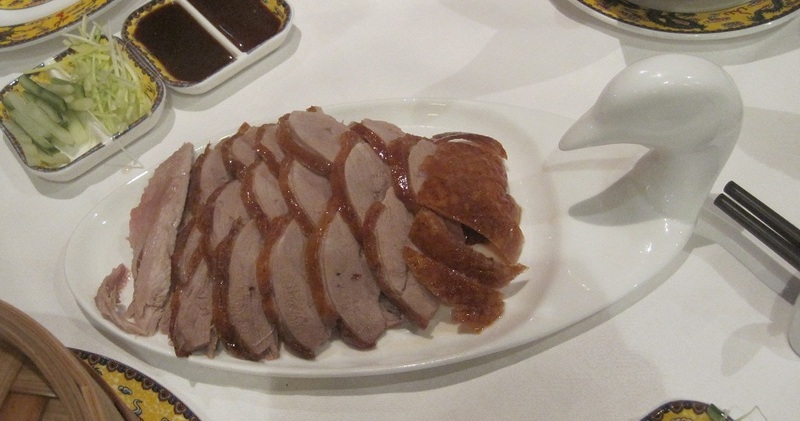 I could get a takeaway Peking duck from Flemington in Sydney and it’d be much better than this duck. In my ensuing depression, I almost forget that we have a second course coming of duck soup, but that’s ok because it seems the waitstaff have forgotten as well. With a few words to the manager, we get it quick-smart. Again a small serving in a cup slightly bigger than a tea cup – not giving me that banquet feel. 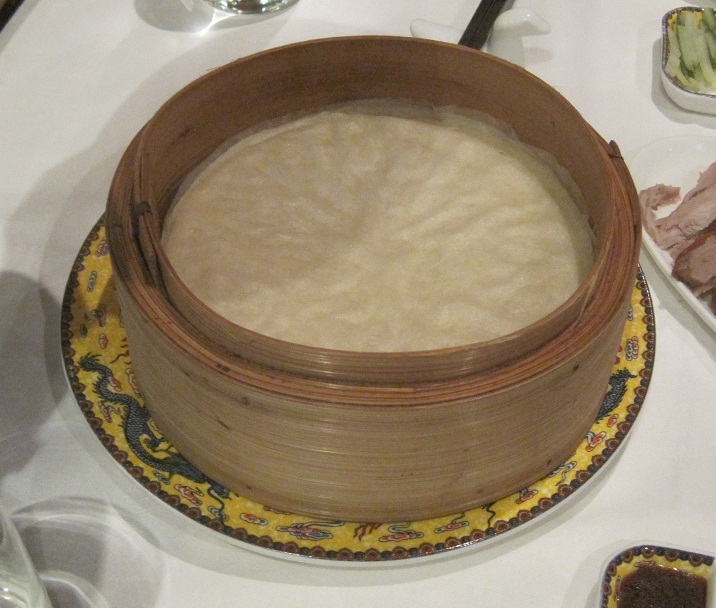 But, this duck soup perks me up a bit because it is a much better dish than the Peking duck we just had. The flavour of the duck is very intense but not overpowering and it doesn’t taste like fat. 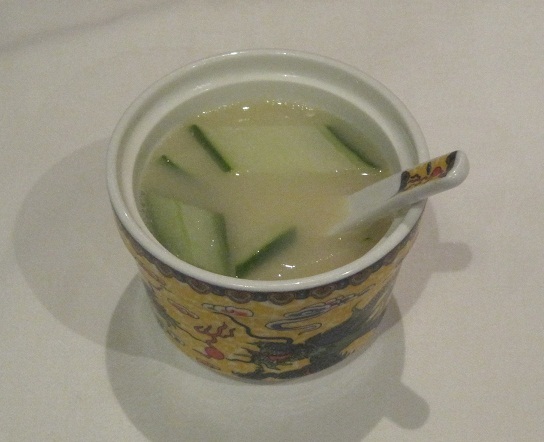 The cucumbers help to cut through the richness of the soup – this dish works for me. I’m not quite to my happy place but I’m getting there. With my duck depression, I was going to forgo dessert, however, my dining companion persuades me to get a sugary pick-me-up and we decide to split a westernised deep-fried ice cream. To my dining companion, I say thanks and a good call. I’ve had a few deep-fried ice creams in my day, and it’s like food court sushi, it’s good but not great, not a standout, but a dependable meal in terms of quality. 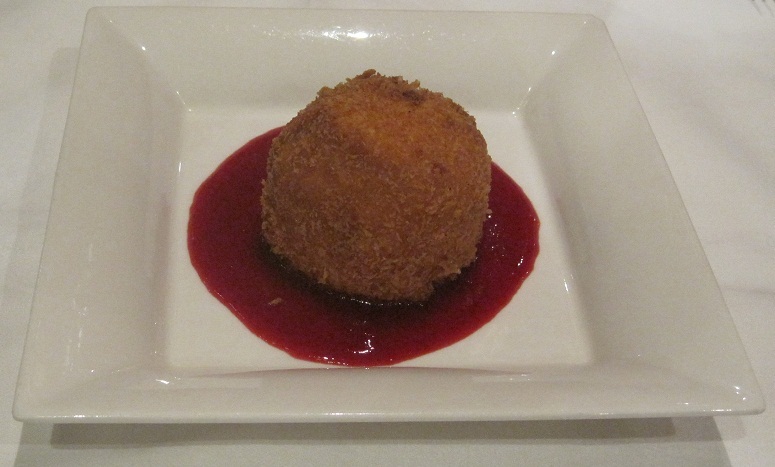 This, however, is a great deep fried ice cream. The outside was very crispy – there was no sogginess at all. The strawberry sauce was lovely and the ice cream was a proper vanilla flavoured ice cream – not a nondescript white cream. You could actually taste vanilla in this ice cream. It was also still cold inside and not a half-melted goo. 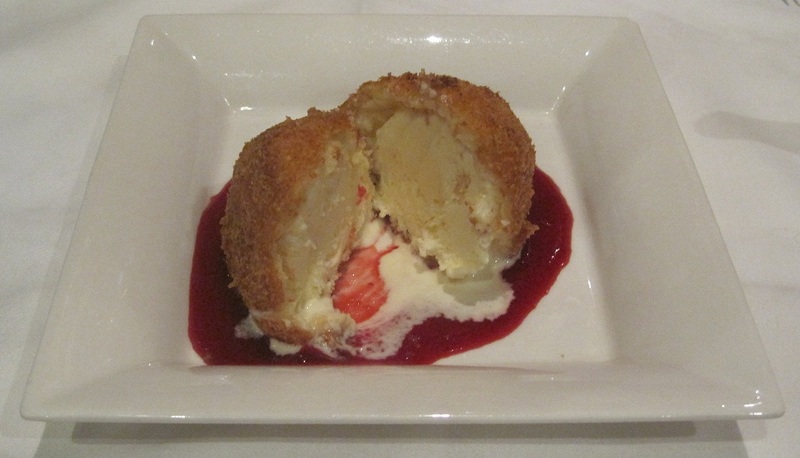 It’s definitely up there in terms of other deep-fried ice creams I’ve tried before. Great dessert, and I’m glad we decided to finish off with it, it didn’t make up for the duck, but it did leave me with a good taste in my mouth. Would I go back? If this place was not a duck specialist restaurant, I would be happy with the non-Peking foods and wouldn’t mind returning for them. As it is, I wouldn’t return here for Peking duck, so why go to a Peking duck restaurant not to have Peking duck? 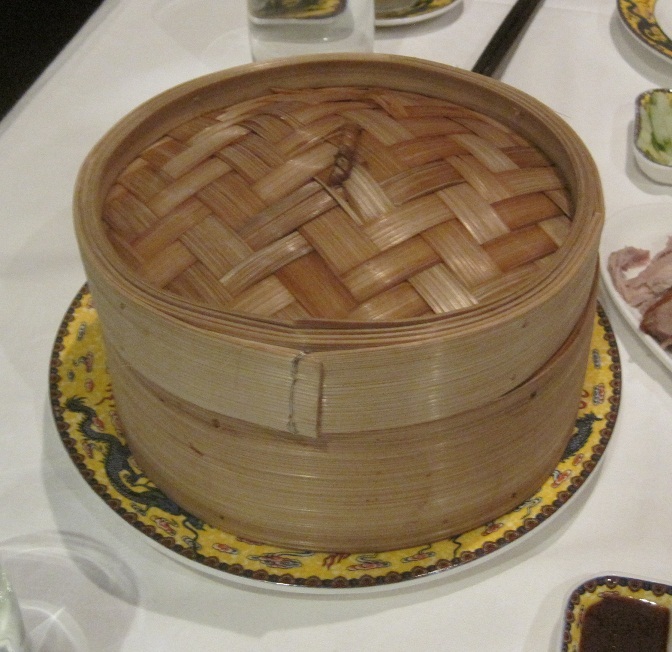 This entry was posted on April 4, 2012 at 6:08 pm and is filed under 3 - Likeable :|, Chinese, Cuisine, Dinner, Lunch, Meal Type, Mega Meal ($20-$30), Melbourne, Price, Restaurants with tags chinese, food blog, melbourne, Peking duck, restaurant, review. You can follow any responses to this entry through the RSS 2.0 feed. You can leave a response, or trackback from your own site.